New Dutch and English sites and CMS. Re-design of all websites, both Dutch and English versions, including new visual and interaction design and custom-built content management system. Highly flexible new web presence fine-tuned to meet both national and international strategic goals. 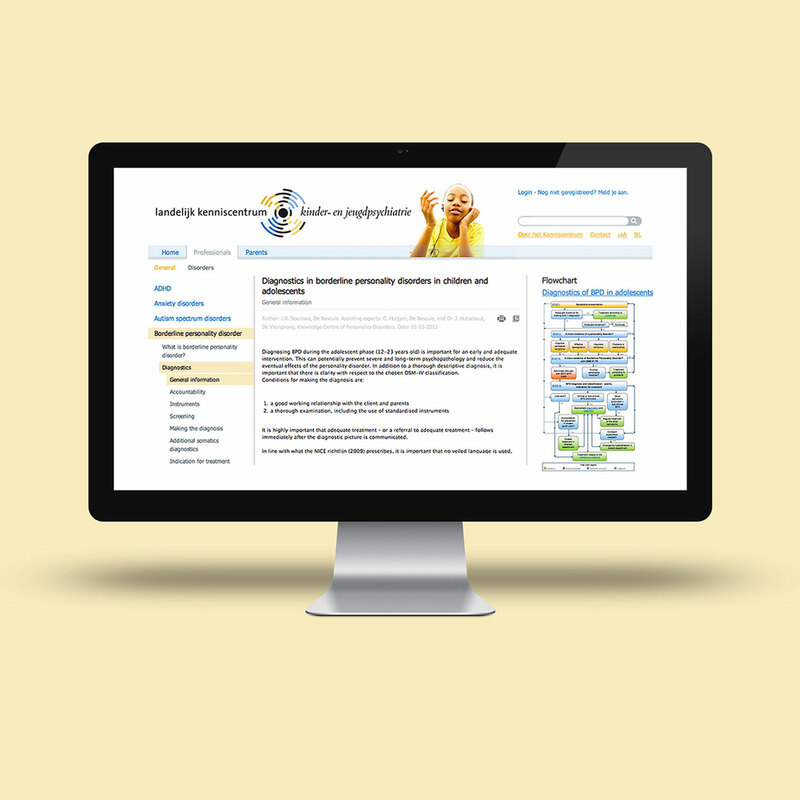 Re-positioning of the website from an online reference work with information about diagnosis, treatment and medication, to an online community of experts enabled to contribute real-time, individually and in groups to the site's content on a broad variety of themes. From 2013 to 2018, when the site was again re-designed, it expanded its content to include new target groups (municipalities and teachers), more than ten new themes including psychiatric support for 0-6-year-olds, support for the transition to young adulthood, and help for refugee children. The community contained more than 100 experts with an active account, and an extensive blogging platform with hundreds of posts. At the Dutch Knowledge Centre for Child and Adolescent Psychiatry, James was involved in getting this important and respected organisation online. Developing several platforms, James researched users’ needs and validated early versions. This included co-creation sessions with children with mental health problems. Many of his findings ran counter to received marketing wisdom and are still used at the Knowledge Centre today. James embodies the rare combination of researcher, designer, copywriter, and then some. Besides his broad skills, he handles all his work with contagious enthusiasm, sincere curiosity and a sharp, critical mind. I’ve found his contributions to have always been enormously valuable.